Did you know that an improper choice of backpacks among school aged children can increase the risks for back pain, and possibly permanent injury? The improper weight distribution on the shoulders, waist and hips increases the muscle strain and bone stress on these areas. The straps can also dig into your child's shoulders that can, in turn, encourage stooping and bad posture while carrying the uneven load. But it isn’t just the improper choice that contributes to these health issues. The improper use of backpacks among kids and teenagers is also to blame. These improper uses include slinging the backpack over one shoulder and failing to adjust the backpack depending on the load carried. Indeed, proper choice and use in kids’ backpacks are a must when ensuring that your children and teens maximize their use in a safe and effective way. With that said, here are our choices of the top 10 best kids’ backpacks. We will also provide tips in making your choice and making children wear their backpacks properly after our top 10 favorites. Kids like their backpacks to reflect their growing interest in vehicles on land, air and sea. This brightly colored Pack ‘n Snack backpack is a great choice for your child, especially if they are in preschool. The bag is available in a variety of colors, which means that you can find the perfect one that appeals to your son or daughter. The backpack has two primary compartments and a side pocket. The central compartment can accommodate larger and heavier items like books and notebooks. The front compartment, which has thermal insulation, can accommodate your child’s snacks for school, such as sandwich and fruits. The side pocket is a great place to store a bottle of water or an umbrella, perhaps even a small toy that your child would like to take along to learn with them at school. What's Great About It: Not all kids’ backpacks are made of kid-friendly, non-toxic materials, but the Pack ‘n Snack is a backpack that takes safety very seriously. You will like that it has a simple yet sturdy design that can withstand the use and abuse of your little one as they explore the world around them. Aside from their usual books, notebooks and pencil cases, modern kids also have their electronic gadgets like smartphone, tablets, and MP3 players with headphones thrown in. 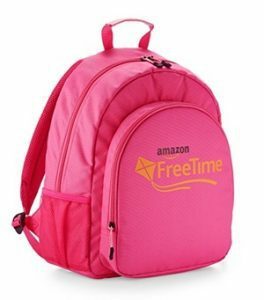 But not all kids’ backpacks have a separate compartment for these devices, so the FreeTime Backpack stands out. Your children can place all of their electronic gadgets in a special compartment designed for these expensive items. Your worries about it being scratched or squished by their other items can be reduced thanks to the thick padding. You can store their water bottle, umbrella and favorite small toys in the mesh pockets while the rest of their things are in the larger compartment. What's Great About It: This bag is available in two gender-friendly colors - pink and blue. You will definitely like the stylish and functional design which is suitable for your modern kid, as well as the thick shoulder straps and carrying handle. Your child will just love that this bag can store their things so well. 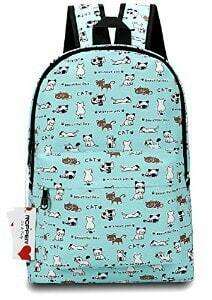 Most toddlers and young children absolutely adore animals, so they will love the Zoo Pack backpack collection. If you want, you can collect all 20 animals including Blossom Butterfly, Cheddar Cow, and Marshal Monkey. Your kids will definitely find a few of the bags that will suit their style and personalities. Each backpack features a spacious front pouch with thermal insulation to keep your child’s snacks as warm as possible. The larger central compartment provides generous space for storing your little one's essentials including diapers, clothes, face towels, and wet wipes. The adjustable mesh pocket can be used for storing a water or milk bottle. What's Great About It: Aside from the adorable animal patterns, the Zoo Pack backpack is made from phthalate- and BPA-free materials. The bag is small enough for a toddler to carry yet roomy enough to place a few of their things in it. Your toddler will also love being able to carry their own items around. Simplicity and functionality are the keys behind the popularity of the Classic Backpack by one of the world’s largest online commerce portal - Amazon. This bag comes in seven colors so all pre-teens and teens will have at least one choice that they love, even if it is pink for girls or blue for boys. While it’s dubbed as a classic, it’s a backpack designed for contemporary use by teens that live such busy lives in and out of school. Your teenager will find its roomy compartments so practical in their daily life, especially when used as a school bag. The 21-liter capacity backpack has several compartments. The main compartment is designed for carrying books, notebooks and other supplies while its secret zippered compartment can accommodate valuable items. The separate compartment has thick padded walls for protecting mobile gadgets, such as your child's laptop, smartphone, and tablet. The front compartment is best for storing smaller items like pens, while the side pockets can be used for other things like a water bottle. What's Great About It: We like its affordable price coupled with its stylish design and functional compartments. Parents apparently like the combination too, so this is a popular choice. 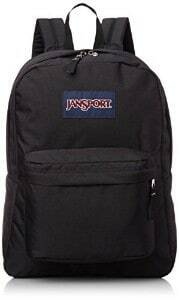 JanSport, a 30-year old brand, is known for its simple yet durable, practical and stylish backpacks which are suitable for pre-teens and teens. The T501 is among its latest offerings that even adults are finding as great all-purpose backpacks for daily use. The key to T501’s popularity is its 600-denier polyester fabric, known for its superior strength and sturdiness over other backpack materials. But it’s the strong and sturdy construction that separates JanSport backpacks for others, and they can be used for more than a few years. The T501 also has a simple yet practical design. The single primary compartment provides sufficient space for a teenager’s school items like books and notebooks. The simple design, however, means that there’s neither an inner padded compartment for mobile devices nor an inner zippered compartment for valuable items. The front pocket makes up for it with an easy-zip closure and an interior open pocket. The back of the bag also features a padded design which serves as a cushion for the lower back. What's Great About It: The T501 is available in 34 designs ranging from solid colors to printed patterns, so there is a wide range of choice that parents and teens like. We recommend it for its no-fuss and functional design that can be used for several purposes, such as for school or casual occasions. Even among young kids, the term “cool” connotes two things – first, it refers to something trendy and, second, it means comfortable temperature. Your kids will then like the Coolwoo backpack for these exact reasons. It’s available in two cool animal-inspired designs – a tiger and a dog – complete with the adorable details including facial expressions. It has cool compartments too, including a spacious main compartment, a front compartment for smaller things, and a side pocket for a bottle. Parents appreciate its materials and construction that contribute to the cooling effect when worn by their kids. The back material is a highly breathable, high-quality and ultra-soft mesh material that allows better air circulation. The entire backpack is also made of water-resistant, lightweight neoprene materials. What's Great About It: We like the adorable animal-inspired design, as did my kids when they first saw it. You, as the parent, will love the breathable netting, sturdy construction, and relatively spacious compartments for a toddler backpack. Parents like buying children's products that serve several purposes. If this is something that you value, then you will like this Yodo backpack because it’s a 3-in-1 item. 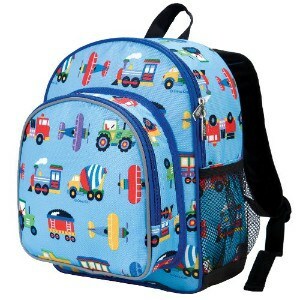 Your kids can use it as a toddler backpack with roomy compartments and a lunch bag. You can also use it as a safety harness with a 50 inch detachable tether, which will keep your child within your radius when you’re out and about. 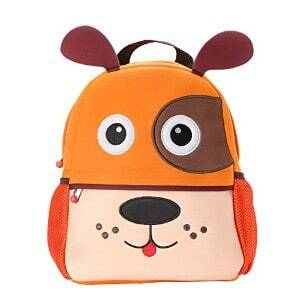 The adorable animal-inspired designs are a bonus to such a multifunctional toddler’s backpack. The designs are a blue cow, a navy shark, a green dinosaur, and a brown dog. Both boys and girls will find a design that will suit their preferences in animals and colors. What's Great About It: We like that the toddler backpack grows, so to speak, with your child. When younger, the backpack can be a safety tether and as they grow, it can be used as a fully functional backpack for nursery classes. Many, if not most, teenagers like to be part of the crowd while still standing out in a positive manner. If your teenager fits this bill, then the Ropper backpack is a great gift. This is still your standard backpack, but there are a few notable differences. Your teen can choose from several interesting designs not usually found in other backpacks. You will also like that the backpacks are made of canvas instead of the usual polyester material that most backpacks are made from. Plus, the backpacks are lightweight yet durable in their construction and comfortable to use, thanks to the thickly padded straps. There are two main compartments and a front pocket with a zipper. What's Great About It: We like the canvas material and interesting designs that are available. Even the patterns are cute and cool, which will appeal to both younger and older teens. Hot Wheels is a brand by Mattel, which is also the owner of the Barbie franchise. 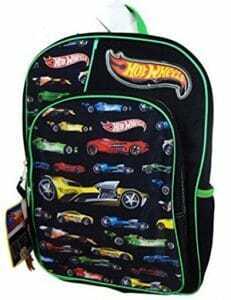 This Hot Wheels back pack is perfect for your boy or tom boy who loves cars. The backpack has compact dimensions – 16 x 12 x 5 inches – so it’s the right size for a preschooler to use. But it’s still large enough to accommodate most of their personal belongings, such as drawing materials and toys. The main compartment is complemented by two side pockets and a zippered front pocket. What's Great About It: We like that each bag already has a Hot Wheels mini-car so your kid can immediately enjoy both the bag and the toy. Teens like to mix and match their stuff, including their bags. This Leaper bag set should provide your trendy teenager with the opportunity to mix and match their bags and their clothes. The bag set consists of three bags – a canvas laptop bag, a pencil case, and a shoulder bag, all of which are characterized by the Bohemian design which is embroidered at the bottom part. The canvas backpack provides plenty of space, thanks to the roomy main compartment and several pockets. The shoulder bag and pencil case may be smaller but these are still roomy enough to store everything that your teen needs. What's Great About It: We like the extra storage options, such as the eyeglass holder placed on the shoulder straps and the metal ring on the front panel. Your teen will love the fashionable Bohemian design as well as the padding all around the backpack. We have to admit that choosing our top 10 backpacks for kids wasn’t an easy matter, especially considering the sheer number of choices, the changing preferences of children as they grow older, and the budget of parents, but we persevered to bring you this list. We considered several factors in separating the best from the bad in kids’ backpacks including the following aspects. We chose these backpacks according to the strength and sturdiness of the materials used since these are the foundation of their overall quality. We read the reviews pertaining to the durability of these materials, especially in terms of their longevity under normal use. We included, for example, the JanSport T501 because many parents attested to its long-term use, many lasting for as long as 5 years with proper care. We also considered the overall quality of the construction because even the strongest, sturdiest, and thickest materials will be useless when the construction isn’t up to par. We visually inspected the top backpacks to check the quality of the seams, attachments between separate parts like the strap and the main compartment, and hardware such as the zippers and rings. We also read the reviews of parents about these matters to make our shortlist. In considering both the quality of the materials and their construction, we also factored in the reputation of the manufacturer. We strongly believe that manufacturers of backpacks with a good reputation, preferably one built over decades of being in the business, will only offer the best products. When you’re at the top of the game, you’re less likely to risk your reputation by offering your target customers mediocre products. We like cool designs that fit the age group for which the bags were designed for, such as animal-inspired prints for the toddlers and solid colors with Bohemian touches for the teens. But cool designs are useless when the backpacks aren’t as practical in their features as expected. When we speak of functionality, we’re referring to the number of compartments and pockets that each backpack has. The compartments must be roomy enough to accommodate several items, such as books, notebooks and a few mobile electronic gadgets, perhaps even a change of clothes. The pockets should also be accessible for the wearer of the backpack. This includes the pockets which are inside the main compartment, the front pocket, and the sides, as well as on the shoulder straps. Many of the backpacks mentioned here have simple compartments, such as the JanSport T501, but these are included for several reasons. You will find that these backpacks will fit a day’s worth of items inside them, thus their inclusion in the list. We also think of functionality in terms of the hardware and carrying handles, among others. 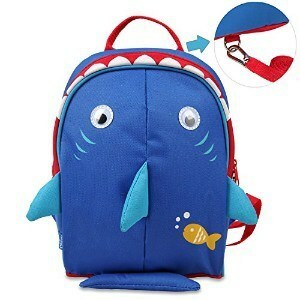 The zippers, buckles and straps should be sturdy, and should function as well as expected so that these contribute towards the backpacks’ optimum use. 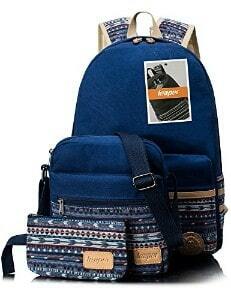 Of course, we also considered the style, including the color combinations, prints, and patterns of the backpacks. We chose the products that will appeal to the age group for which these bags were made. You should obviously choose your child’s backpack depending on their age, personal style, and needs that they will have, such as whether it’s for school or for camping. For a younger child, you can decide based on what you already know will make them happy. For an older child, like a pre-teen or teen, you’re well-advised to let them choose which one they like best, but be sure to set a budget. Whatever the age, keep these general tips in mind so that you can make the smartest choice. Check that the materials are kid-friendly. This means that these shouldn’t contain harmful chemicals, such as formaldehyde, BPA, PVC, phthalate, and lead, among others. Look for features which offer maximum function and comfort for the user. These features include padded straps and back support, waist or hip straps, adjustable shoulder straps, and multipurpose compartments and pockets. Inspect the backpacks, if possible, from the carrying handle to the bottom part. The seams and the fabric (e.g. 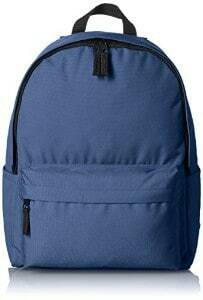 canvas or polyester) should hold even when the backpack is filled to its capacity. The zippers should slide smoothly while the Velcro straps should stick well. You will be unable to check the overall quality of a kids’ backpack when you’re buying online. Instead, you can read the manufacturer’s description and the consumer reviews. You will also be able to ask questions in forums as a substitute. Making the right choice in a backpack is just half of the battle. Did you know that as many as 48% of children aged 15 years and up experience chronic back pain due to the incorrect use of their backpacks? You shouldn’t dismiss these discomforts either, as it increases the risks for health issues, including permanent injury. The shoulder and hip straps aren’t properly tightened. Your child’s upper body and shoulders are then pulled backward resulting in bad posture. You will observe them arching their backs or leaning forward to compensate for the imbalance. The process of walking up and down stairs and ramps can cause twisting and jerking motions. Your child is at high risk for lower back damage because of these sudden movements. The backpack is placed too far away from your child’s back. Your child will also experience lower back pain because any pivoting motions from the backpack will have an impact in this part of their body. The strap is worn on only one shoulder. Your child is also under strain when they do this because they are forced to bear the brunt of uneven distribution of the weight. With this in mind, you can guide your child in the proper way in which to wear their backpack, which will reduce their risks for injuries. Reduce the load of the backpack if your child appears to be struggling when they put the bag on and remove it from their shoulders. Adjust the shoulder and hip straps according to your child’s size and strength. The adjustments should ideally be done every time things are added or subtracted from the backpack. This will ensure even weight distribution over their shoulders, back and hips. Pack the things inside the backpack to optimize even weight distribution. Basically, heavier and larger things should be at the center and towards the bottom part of the backpack. Teach your child the proper way to wear a loaded backpack. Bending at the knees will minimize the twisting motion involved in moving with the backpack. Teach your child to carry their backpack over both shoulders, allowing for an even distribution of weight. Better yet, you should become a role model in the proper use of backpacks. Your child is more likely to follow your example rather than just your words. Teach them by showing them the correct ways to wear and adjust their backpack. If you think of your kid’s backpack as an extension of their clothes, they should fit them well in terms of size and style. Plus, backpacks are designed to be practical containers for their school supplies, mobile devices, and valuable items, so functional compartments, straps and hardware are a must. With our top 10 picks for backpacks, you should have an easier time making a great and well-informed decision for your child.